A new year and a new focus to ensure we meet our target for our attendance, we are determined to reach a mimimum of 97% this year and are launching some new initiatives to help us to achieve this. We will also be working with Claire Gardner (Attendance Officer) who will be visiting the families of our persistent absentees/late pupils. Welcome back to the start of the new academic year. Once again attendance is a priority at Waverley and we will be working hard to ensure that we meet the high target set by Mrs Leeming of 97% for the school year. Once again we will be working closely with our Attendance Officer Mrs Gardner who is on hand to offer advice if you are having any issues with regards to your child's attendance at school. Our attendance shop is open once again and the children will be rewarded each week, half term and termly. Year 4 had 98.3% attendance this week taking the lead closely followed by Year 1 & 2. Overall the school had 94.9% attendance. This week our overall attendance was at 97.7%. Our Year 5 class had 100% and only one late all week. Well done Year 5. All of our classes were above national average this week. This week our overall attendance above national average at 97.4%. Year 1 were in the lead this week with a total of 99.7% followed by Year 4 at 99.4%. 6 out of 8 classes were all above the national average and lates have improved this week with a total of 19. This week our Nursery class have a full 100% attendance followed by Reception with 97.6%. Overall, the whole school attendance remains above national average for the 3rd week in a row at 96.5%. This week 6 out of 7 classes were above the national average. UKS2 took the lead this week withYear 5 at 98.8% followed closely by Year 6 with 98.6%. This week Year 3 took the lead with 97.9%. Second place was a total of 97.1% in the Year 6 class. Overall 4 of our classes were above the national average. This week 3 year groups were above the national average of 96.1% with year 4 winning this week with 98.3%. Overall school attendance was 95.3%. Our attendance this week is 95.3% for the whole school, a huge well done to Year 1 who achieved amazing 99%. It has been a great week for attendance this week with the whole school exceeding the national average with 96.4%. Huge congratulations to Year 1-4 who all achieved above our target of 96.1%. This weeks winners in a very close run week is Year 1 with 98.1%. Welcome back after the half term break, we are now on the countdown to Christmas with just 7 weeks of school to go. With this in mind we have so many exciting things for children in the next few weeks so lets continue to encourage them to school everyday. Well done to Year 6 who won this weeks attendance award with 98.9% this week, this was closely followed by Year 1 & 2 both with classes over 97%. A huge congratulations to both Nursery & Year 2 who both acheived perfect attendance of 100% this week. This was well supported by Year 4 & Year 5 who also surpassed the government target of 96.1% this week. Well done to all of those children and their parents. Overall this week we reached 95.6% slightly below our target, let's continue to support our pupils to push hard for our final week of this half term. Congratulations to Year 3 who had the highest attendance this week at 96.9%, this was closely followed by Year 6 with 96.5%. Overall attendance fell this week to 93.2%. Please continue to encourage your child to maximise their attendance. A huge congratulations to Year 1 who achieved 100% this week. Overall our attendance was 95.8% with 4 classes exceeding the government target of 96.1%. lets keep up the good work and see if the remaining classes can catch them up. Congratulations to Year 3 who have the best attendance in school this week with 99.7%, they have made an outstanding start to the year. Welcome back for the last few weeks of this year, attendance has rose across school again this week with us reaching 95.3%. This is still below our target so hopefully we can get this back up for the remaining weeks. Late marks dropped again this week with just 36 across school. Our new elcetronic sign in system will record the exact amount of time your child misses due to lateness or early collections and this will be monitored closely by the school. After a fabulous week last week our attendance has taken a dip this week with the whole school dropping to 93.5%. Our late marks have also increased dramatically this week to 49. It has been a fabulous week on the attendance front, with the whole school exceeding the governments national target by hittingt 96.2%, well done to everyone. Please lets continue to work hard to improve attendance across the school as we head into the last half term. We have once again been hit by viruses this week which has had a major impact on our attendnce this week, we have dropped to 94%. Hopefully children will recover of the weekend and we can continue to chase our attendance target. We have made a good start to the summer term with the whole school reaching 95.9% this week, let's hope with the summer sun shining that our attendance continues at this level. The schools target for the year is to achieve at least the national average of 96.1%. However as you can see below we are still a way off this target and we need to continue to work together to improve our overall attendance. As you can see we are well below our target, with no individual classes reaching 96%. The schools target is to achieve 96% for the year. It has been a better week for attendance this week with the whole school just falling short of the National target reaching 95.8%, the number of late marks is also starting to drop and this week we had 45 altogether. Attendance has once again fallen below the expected level this week with just 93% across school. Please look out for our new attendance information booklet that will be coming home soon. It is a great start to the new year with the whole school achieving 96.9% this week which is above the government target, let's see how long we can keep this up. The number of late marks is still a concern with 58 recorded this week, our Attendance Officer will be focusing on this group in the next few weeks. Our attendance has once again been affected by the sickness bug across school, meaning this weeks whole school attendance was just 91.9%. Congratulations goes to Year 4 who were the only class to achieve national average with 96.4% and winners of the attendance award this week. Overall for the term after an fabulous start we have slumped over the last few weeks and reach only 94.7% for the whole term to date. This is well below our target of 97% despite a large proportion of children being rewarded each week for 100% attendance. This means the school along with the Attendance Officer and Local Authority will monitoring/visiting our worse attenders in the new year. Our attendance has taken a drop once again this week with the whole school reaching just 93.8%, the number of late marks has also risen to 101. Our Early Bird winner this week is Nursery with just 3 late marks all week. Overall our attendance was 95.1% and we had 59 late marks. Overall our attendance has increased again after last weeks to 95.7%. Late marks have increased this week to 63. Well done everyone we are on the last few weeks of a long first term keep up the good work. Our whole school attendance has fallen this week to 93.2%, this is mainly due to an outbreak of the sickness bug across school. The number of late marks this week is 51, you may have noticed that we will ask the reason why your child is late on entry through through the main door. It has been another great week at Waverley on the attendance front and for the 4th week in a row we have hit or exceeded the national mark of 96%. This week overall attendance is 96.0% with 48 late marks which is down 20 on last week. It has been another fabulous week on the attendance front with our whole school attendance rising from 96.2% last week to an amazing 96.5% this week. Congratulations on this great achievement and lets keep it going. Unfortunately the number of late marks has increased dramatically from 29 to 68 this week. We need your support to ensure that the children not only get here each day but also on time. Following the move to pure year group classes we will now issue our awards by year group. The winner of the attendance award for the lower school is Year 2 with a fantastic 98.1%, the early bird award goes to our Reception children with 9 late marks this week. A huge well done goes to Year 4 who had perfect 100% attendance this week, The early bird award is shared between Year 3 and year 6 who both recorded 7 late marks each. 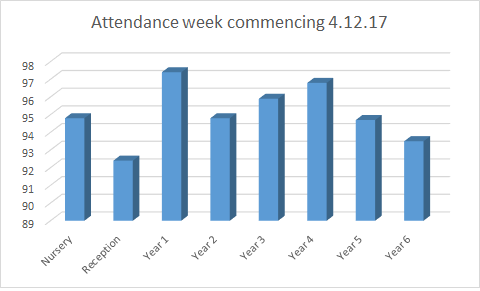 It has been a great start to the new term for attendance this week, overall the whole school attendance increased to 96.2% which is above the national expected figure and only 29 late marks were recorded. The winners of the attendance award goes to Mrs Thomson's reception class with 98.4%, the early bird award goes to the other reception children Miss Anderson's class with only 1 late mark recorded. A Huge congratulations goes out to some of our youngest pupils. The attendance award goes to Mrs Millers' Year 3 children with an amazing 98.8% and the early bird goes to our other Year 3 class Mr Roberts whose children recorded 0 late marks at all. Overall it has been a good week for Reception and Year 3 in particular. Once again those children with 100% attendance for the week and no late marks will visit our rewards shop. We have come to the end of our first half term and our attendance for the week has dropped from last weeks amazing 96.1% to 95.3% this week. Overall for the term we are 94.7% which is well below our expected level and 0.4% below what we were this time last year. This has been mainly caused by term time holidays in September. The children who have 100% attendance with no late marks for the whole half term have now visited our termly rewards shop and the will be entered into the draw for the family hamper donated by our attendance hero partners Vision for Education. The winners of the attendance award are Mrs Leadbeater's class with a brilliant 98.8%, the early bird award goes to Miss Anderson's class with just 1 late mark this week. This weeks winners for attendance are Mrs McGettrick with a fabulous almost perfect 99.1%, the early bird award goes to Mr Garrod's class who all arrived every day on time. Once again we have a marked improvement in our attendance this week with whole school reaching 96.1% and meeting the governments expected level. Our late marks are also starting to fall with just 37 for the whole school this week. The winners of the attendance award this week with 97.1% is Miss Clarke's year 2 class. The winners of the early bird award this week with just 1 late mark is a 3 way tie between Miss Anderson, Mrs Thomson & Mrs Leadbeater. The winners of the attendance award this week is tie between Mrs McGettrick & Mr Garrod with a fabulous 98.2%. The Early bird award this week also goes to Mr Garrod with just 1 late mark. The first week of our new attendance challenge got off to a flying start with 207 children having 100% attendance and no late marks and getting their first visit to the rewards shop. This intern had a positive impact on attendance raising it from 93.3% last week to 94.7% this week. We still have a few children who have taken term time holidays and when they return we should be able to get closer to our target. The winners of the attendance award this week is Miss Anderson's Reception class who achieved an amazing 100% attendance this week. Unfortunately only 1 other class met the expected standard of above 96%. The Early bird winner was Mrs Thomson's class who recorded no late marks. Attendance in the upper school was particularly poor this week with no classes reaching the required 96%, in fact the class with the highest attendance was Mrs Lynch with just 94.6%. The Early bird award was shared by Mrs McGettrick and Mrs Miller with just 3 late marks. Overall our attendance has fallen again this week and is well below expected standard at just 93.3%. The winners this week are Mrs Thomson's class with 97.6%, closely followed by Mrs Leadbeater on 97.1%. A great week for Mr Roberts class who achieved 99.6%. Overall despite the drop in attendance in the lower school our attendance for this week is 95.6%, this has improved on last week but still falls short of national average and is well below our school target of 97%. The number of late marks has doubled this week to 4, please try to ensure your child is here on time as they are missing valuable time in class. The classes within the lower part of school had an outstanding start to the new year with Mrs Thomson, Miss Anderson, Mrs Leadbeater and Miss Clarke's classes all achieving 100% in the first week. Unfortunately Mrs Armitage's class fell well below on 84.3%. Mr Garrod's class were the winners of the attendance award for the upper school with 98.9%, with just 2 other classes reaching national target of 96.1%. Whole school attendance for the week is just 94.9%, the upper school falling well below expected has had a detrimental affect on our overall figure despite the fantastic results from the lower school. Overall the children were keen to arrive on time as only 20 late marks were recorded.